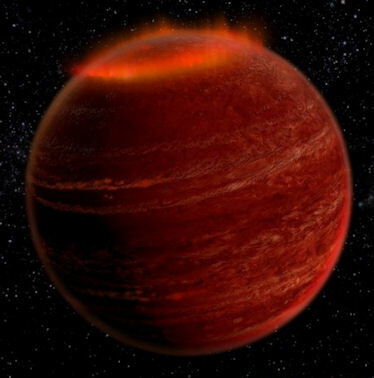 For a number of years, I've been trying to figure out how a massive planet could have evaded direct detection in visible light and infra-red, despite there being a lot of indirect evidence for its existence. I've not been alone in wondering this, although many of the researchers who have been working on this problem have been coming to it from a slightly different angle. They've been of the opinion that Nibiru is almost upon us, but has not been spotted by astronomers, for a variety of reasons (cover-up, planet hidden behind the Sun, obscuring artificial shield, exotic object, and so on...). I've always been convinced that this missing planet lies a long way out, and since the early 2000s I've considered it probable that it doesn't actually come through the planetary system at all any more, although it likely did in the distant past. So, I've been trying to figure out how this object has evaded detection - without resorting to exotic solutions, like mini-black holes, Dark Matter, plasma shields or such like. Early last year, I considered the possibility that the conditions for a planet lying beyond the Sun's extensive magnetic atmosphere (known as the Heliosphere) might be somewhat different to those within. Clearly, this is the case to some degree at least, because the Sun's expanding radiation output, heat and plasma drives outwards in the form of the solar wind. This process is continuous, but is most dramatically highlighted during coronal mass ejections - exceptionally strong examples of the usual coronal atmospheric effects around the Sun that can be observed during total eclipses of the Sun. The Solar Wind pushes outwards through the solar system, eventually interacting with external energetic galactic streams of plasma containing Interstellar Medium (ISM). 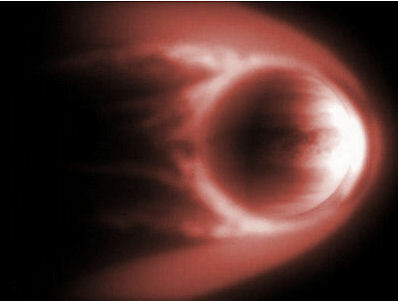 The interface between the Solar Wind and the streams of ISM comprises of two zones - the Termination Shock, where the velocity of the solar wind drops below sub-sonic levels, and the heliopause beyond, where the solar wind is swept back by the action of the external tidal forces, forming a tear-drop around the roughly spherically shaped termination shock. How would this affect a planet located within these various zones? Both cosmic areas inside and outside of the heliopause have streams of high energy particles to deal with, even though their origins are different. What I wondered was whether these zones dealt with accumulated particulate matter in different ways. Why? Because, I thought, if the solar system were to move through, say, a nebula of dense dust, then objects outside the heliosphere might become wrapped up in that dust, while objects inside the heliosphere are not only partly protected by the heliosphere, but also cleaned of this dust by drag effects causing the dust to fall towards the Sun over time (1). So, essentially I wondered whether an undiscovered planet located beyond the heliopause might actually be wrapped up in some kind of dark nebula, which is notoriously difficult to image light and infra-red light through. This solution would only work if the object in question does not re-enter the heliopause in the time between the solar system's motion through the nebula from which the object picked up the dust. This would likely be a minimum of several millions of years, if not considerably longer, as such encounters would most likely occur when the Sun's carousel motion around the galactic centre brought it through the galactic plane - roughly every 35 million years. This would effectively rule out a scenario where a Nibiru-like world, which is thought to move through the asteroid belt every 3,600 years during its perihelion transit, could be wrapped in such an obscuring cloud. After all, each time this rogue planet moved through the inner solar system, the Sun's exuding wind would rip this extended cloud of debris from it, like it does with cometary volatiles, forming their beautiful comae. 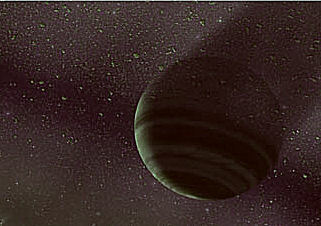 However, if the undiscovered massive planet were to simply move between the outer zone of the heliopause and the inner edge of the Oort cloud, as I anticipated in my book 'Dark Star' (2), then it might have accumulated a significant quantity of material over the lifetime of the solar system, unimpeded by the solar wind. The proposals put forward last month by Dr Brown and Dr Batygin from Caltech (3) correlate well with these parameters, and they have charged the astronomical community with the duty to find this object. 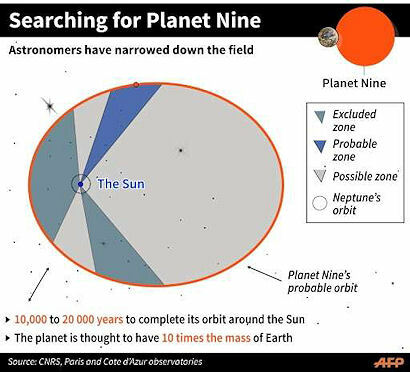 Work is already underway internationally to narrow down the area of the search for Planet Nine, with papers quickly appearing considering how such an object would impact upon solar system ephemerides - particularly that of Saturn whose position and movement is now known very accurately, thanks to Cassini (4,5,6). However, is it possible that this object actually be considerably more difficult to observe than they anticipate? That would certainly make sense of a lack of observational data from WISE, for instance. Spurred on by their indirect findings, and some of the strong correlations between Planet Nine and my Dark Star proposals, I've revisited the Shroud Hypothesis. Except this time I've formulated my ideas and arguments in a more scientific format, writing a paper complete with supporting evidence and academic references. It's an exploratory paper, and takes in a wide range of diverse outer solar system anomalies - all of which share one thing in common, I believe - that there is an ongoing but intermittent creative process at work in the solar system, generated by the occasional inclusions of nebula gas into the space around the planets. Over time, this material is removed by the usual processes at work to largely clear the space around the Sun of dust. But, before that can be achieved, I argue, accretion of dust around outer solar system bodies can take place. My scientific paper, currently in draft format, can be viewed online (7). It's a work in progress, as I attempt to encourage scientists to test the various aspects of this hypothesis. The material contained within the paper will be fleshed out and explained in depth and clarity in a forthcoming non-fiction book, which I am currently putting together. I hope that it, as well as the ideas which naturally build from it about the nature of the Dark Star, may be the final key to this enduring mystery. Stages in human biological and social development over long periods of time (which Sitchin often pointed to as important markers for a return of the planet Nibiru) (5). These, you might think, provide a fairly strong pointer towards cycles which might integrate with the return of Nibiru. However, note that the ante-diluvian King Lists, which seem to offer the most concrete correspondence with higher numbers in the Sumerian sexagesimal numbering system, require the inclusion of the ner, or 600 years. If the reigns of these early rulers were connected entirely to orbital periods of 3,600 years, then those of the last two ante-diluvian kings, En-men-dur-ana and Ubara-Tutu, were measured in part-orbits. So how would that work? Furthermore, after the purported Flood, Kingship came to the ancient Sumerian city of Kish, and the length of the reigns began to be measured in hundreds, rather than thousands of years. So, there appears to be more flexibility built into these ancient chronologies than is suggested by simply alluding to the periodic return of a planet. Perhaps the central importance of the sar as a 'princely' or 'royal' number (6) was the crux of the matter? In which case, why chose 3,600 and not, say, the rather grander 36,000 (the Sar'u in Old Babylonian) or even the Sar'ges (60x60x60=216,600) (7)? These numbers could just as adequately describe the long orbital period of a planet in a comet-like orbit. I should be absolutely clear about this: There is nowhere in Mesopotamian writings where it is written "The orbit of the planet Nibiru is 3600 years". 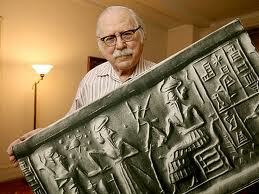 To arrive at this conclusion Sitchin had to do some detective work, and make a lot of assumptions. In doing so, were there any other factors guiding his judgement? Reading the latest book of his essays, I believe I've found the answer, and, I'm afraid, an argument about this number that many Sitchinites may not want to hear (in which case, look away now...). I find the 'heat sources of Olam' a particularly intriguing reference! Other translations of Olam opt for terms like 'everlasting' and 'eternity', but Sitchin put forward a cogent argument that these later translations into English are misguided, and that Olam "is the term which stands for world" (8). In the discussion between the rabbi and the heretic, Earth and Olam are separated by seven heavens, each of 500 years. Hence, as Sitchin put it: "...The complete journey through seven heavens from the world called Earth to the world that is the Divine Abode lasts 3,500 years." (8) He then argued that this approximates to the orbital period of Nibiru, which he determines to be 3,600 years, and hence Nibiru's orbit is confirmed by this ancient Hebrew text. However, that's not exactly what is described here. The journey through the seven heavens is between one location and another that lasts 3,500 years, not the time it takes a world to periodically return. Indeed, one can quite imagine that the Jewish scribe of this text could have indicated such a return easily by using terms like 'the return of the Kingdom of God', or similar. Instead, what we have here is the description of a linear journey between Earth and another world which takes the traveller 3,500 years. The implication of this is that incredibly long space journeys between Earth and Olam (corresponding, Sitchin argues, to the Sumerian Nibiru) must be made by the traveller seeking a destination beyond the seven heavens (which one might readily assume to be the other 7 planets in the solar system; the dwarf planet/KBO Pluto being defunct). One might argue, then, that this reference is made to the frequency with which these journeys are made, and that those journeys are best made when Nibiru (Olam) is at its closest aspect, during its perihelion passage which Sitchin argued reaches as close to Earth as the Asteroid Belt between Mars and Jupiter. But, again, this is not actually what is said in this text, and given Sitchin's proclivity for taking these writings extremely literally, that must provide food for thought. So, in the context of last month's sensational announcement of the highly probable existence of 'Planet Nine' by Dr Brown of Caltech (10), and the various factors which seem to link that proposed body with some of Sitchin's other orbital descriptions (long ellipse, orbital inclination, perihelion/aphelion positions) (11), then does this ancient Jewish description make more sense of what we're looking for? I would say so, yes. I would say this indicates that Olam is located way beyond the seven other solar system planets, and must be reached via a mind-boggling long journey through space, perhaps by some kind of celestial 'ferry' of as yet unknown provenance (like a comet?). Once this 'Planet Nine' is discovered, perhaps 'Olam' would make a rather fine name for it? A known sub-brown dwarf, which had previously been thought to float on its own through interstellar space, has now been allotted a parent star by sharp-eyed astronomers (1). The two are separated by about 7000 Astronomical Units. As a result, the sub-brown dwarf's ultra-wide orbit around this parent star takes a colossal 900,000 years, making this the widest orbit yet discovered between planet and star. The sub-brown dwarf 2MASS J2126, which lies about 104 light years away, is thought to be about fifteen Jupiter masses, and is relatively young at somewhere between 10 and 45 million years old (2). At this kind of age, an object of this size is still burning up some nuclear fuel, and gives out its own light. Ultra-cool dwarfs like 2MASS J2126 eventually 'go out', becoming much darker planets - more like a smaller, smouldering equivalent of Jupiter. These older objects are what I call Dark Stars, and they become extremely difficult to spot. Certainly, at 7000 AU distance, it would reflect back only the tiniest amount of light from its parent star. So, given how these objects emit their own light for only a tiny fraction of their full lifetimes (and they would easily outlive our constantly-burning Sun), then we can extrapolate from this chance finding that there are potentially a huge number of Dark Stars in wide orbits awaiting discovery around stars. This has always been an argument set out against a Nemesis/Tyche/massive Planet X object in our own solar system, as such a concept does not fit well with currently understood models of solar system formation. But as more evidence comes forward that these types of exoplanets are actually common, as I believe them to be, then the old models of planetary system formation will simply need updating. I met with my good friend and author Massimo Fratini, as well as Adriano Forgione, editor of two Italian-language magazine publications, 'XTimes' and 'FeniX', whilst visiting Rome earlier this month. 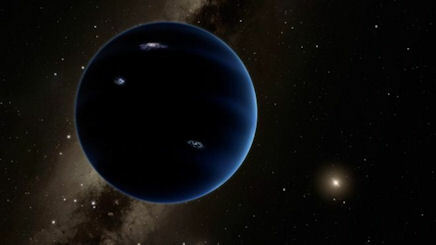 We had a long talk about all the recent research developments involving the announcement of Planet Nine, and various other Planet X news, as well as the wider impact of the latest scientific discoveries. 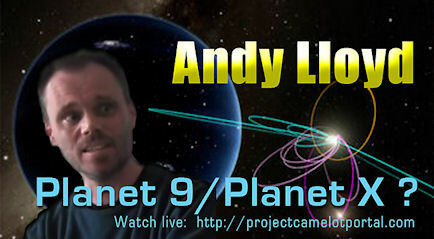 I plan to head back to Rome for Massimo's latest Planet X conference, to be held on Sunday 29th May. The conference is to be held at the Hotel dei Congressi (http://www.hoteldeicongressiroma.com/en), which is handily situated close to the end Metro stations of Rome's underground Line B, to the south of the city. 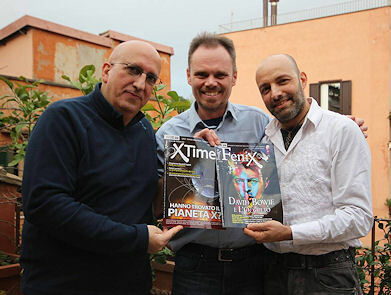 This will be my third appearance at Planet X conferences at Rome, organised by Massimo's popular magazine 'Segnidalcielo' (http://www.segnidalcielo.it/). You might wonder how I managed to become so involved with these guys from Italy, when my appearances at conferences in the UK and USA are rare, to say the least! 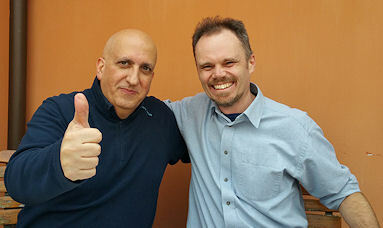 I was first invited by Massimo to speak in Rome back in 2009. I didn't realise this at the time, but the suggestion to write to me was actually made by the late Zecharia Sitchin, whom Massimo had first approached. Sadly, Zecharia was not well enough to travel to Rome by then. Perhaps he suggested that Massimo ask me instead because I live in Europe, but Massimo was already in the process of inviting other speakers from the US for the conference. So, perhaps this was also something of an endorsement by Zecharia himself, who was well aware of my Dark Star ideas through correspondence between ourselves, and had written about the nature of the Planet X body with that in mind in his final book. So, this year, Massimo is presenting his new book "The Return Of Planet X" to the conference, and I will be one of a supporting cast of researchers presenting new work alongside him. I, like him, have a lot to talk about, with the exciting developments in this field of late, as well as my latest theory to explain some of the difficulties which still remain unresolved. It should be a very special event indeed! In conjunction with webmaster Chris Marabate, I'm in the process of building a whole new Dark Star website. Up until now, I've been using old-fashioned Frontpage as an html editor, which is pretty basic by today's standards. The new website uses WordPress to create tablet and mobile-friendly pages, with a number of interactive elements built in. I'm currently loading up my latest 2016 blog entries onto the site and, over time, I'll work through the best of the Dark Star articles from the last 17 years. I'm running this in conjunction with this site, and the traditional Dark Star Theory website, now providing three independent platforms for this material on the Internet. Here's the link to the video interview I had, over Skype, with Kerry Cassidy on 29th January 2016. While I was in Rome with Mrs DarkStar, I took the opportunity to visit many of the wonderful sights that this ancient city has to offer. As you might appreciate, I'm always on the look out for the kind of symbolism that might be associated with the Dark Star. In the pantheon, I spotted this rather ornate fresco, resplendent with star-filled crosses, and a number of winged star symbols. This series of astronomical symbols lies behind a pair of pillars, each one of which is topped with a star of its own. There is thus, pretty clearly, an archaeo-astronomical theme to this series of motifs. So, here we see this important symbolism employed in Rome's ancient Pantheon temple (now quite inappropriately converted into a Christian church of sorts, albeit one mixed up with all kinds of weird and wonderful imagery). Below the two pillars is a shrine featuring a 7th century icon of a black Madonna and Child, which reminded me of a similar shrine in the enigmatic Chartres Cathedral (1). I suspect most Christians gazing at the shrine would simply think this was all very decorative. Taken as a collection of symbols, however, I think this is pointing towards some rather esoteric ideas. The Winged Disk is certainly imported into this arrangement from more ancient sources. Arguably, in this context at least, the black Madonna and Child might point to a celestial meaning, too. The ancients revered the planet Venus, as well as the Moon, as female deities. The ancient Egyptian goddess Isis was associated with the star Sothis - now Sirius - the brightest star in the star, located close to the constellation Orion - which depicted her lover Osiris. 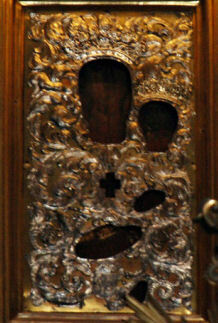 A new deity born out of this goddess takes on special meaning - Jesus to the Christians, Horus to the ancient Egyptians. In a celestial context, this would be the appearance of a new star or planet in the vicinity of Sirius/Orion. And, looking at the rest of the decorative fayre on show behind the two starred pillars in this shrine, that new celestial feature took the form of a starry cross, or a winged star. Before they embraced Christianity, the Romans celebrated this particular iconography with a different deity; namely, Mithras, whose origins remain mysterious and contentious (2). This often-assumed 'Sun-god' was actually a quite separate celestial entity from the Sun, and was worshipped in underground caverns decorated with much zodiacal imagery. Mithras is depicted killing a bull (Taurus) and this celebrated tauroctony is absolutely rammed full of celestial imagery and constellations. The second scene involving Mithras is the Banquet of the Sun, involving, well, the Sun as well as Mithras enjoying the feast of the slain bull, with Mercury in attendance. So, the cult of Mithras celebrates an important journey across the heavens of a fiery object, slicing through Taurus and achieving perihelion before heading back out into the darkness on its celestial chariot. Taurus, Orion and Sirius are all in the same celestial neck of the woods. I think that the imagery employed in the Pantheon, and in other Black Madonna shrines, accommodates many of these same important themes, adapted for a new audience within the context of a new religion. In other words, an evolution of the Cult of Nibiru.